This weekend, I pulled a pack of pork tenderloins out of the freezer without any idea of what to do with them. But I picked up my copy of Tapas: A Taste of Spain in America, by José Andrés (of DC's Café Atlantico, Minibar, Jaleo, Zaytinya, and Oyamel) with Richard Wolffe, and found a recipe for pork with apples, Solomillo Asada con Manzanas. I had apples and onions on hand, so it was a go. The original recipe called for roasting the meat at 250ºF for 25-30 minutes to reach an internal temp of 140º. When I pulled out the thermometer at 140º, blood ran out. (Photos in the cookbook showed a nearly-raw interior, but I didn't think that was the cooked dish because the meat was still in the sauté pan. Apparently it was the finished product.) I don't mind undercooked pork, but I really don't want to eat it rare. So I upped the oven temperature to 300º and cooked the meat until it reached 153º or so. When I removed the thermometer at that temperature, the juices were barely pink. Because we had already partaken of the usual starchy options during the week (potatoes, rice, pasta), I opted for the very non-Spanish polenta. My last attempt at polenta turned out weird and watery so this time I cheated and used instant. And it was very fast and actually pretty good. 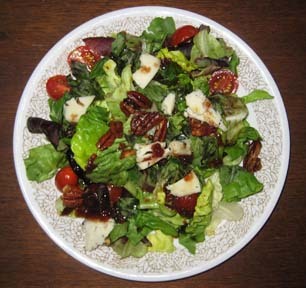 As for a vegetable, I made a salad to use up odds and ends of stuff hanging out in the fridge: a bit of goat's cheese with truffles; grape tomatoes that were starting to get wrinkly; a handful of candied pecans from Cajun Kate's. And I topped it with a balsamic vinaigrette with some cherry preserves added for sweetness. The meat came out perfectly - succulent, tender, still vaguely pinkish in the center. It was the best tenderloin I've ever cooked, hands down. The onions and apple (the recipe called for one Golden Delicious; I used two Fujis) were tender and flavorful, but not too sweet. The recipe called for 5 springs of fresh oregano, which was to be placed over the apples and under the meat before roasting. I'm not a big fan of oregano, as I think it's an overpowering herb, so I waved my little jar of McCormick's oregano over the sauté pan at some point, adding probably 1/16th of a teaspoon. That was plenty. The only other seasoning in the dish was salt and pepper, and really, that's all it needed. Preheat oven to 300ºF. Cut off ends of the tenderloin, saving for another use. Cut the tenderloin in half. In a large ovenproof sauté pan, heat the butter and olive oil over medium heat. Add the apple and cook until it starts to become brown and soft, 8 - 10 minutes. Remove the apples from the pan and set aside. Add the onions to the pan and cook until they start to brown, 4 - 5 minutes. Return the apples to the pan. Top the apples with the oregano sprigs. Season the tenderloin with salt and pepper and place the meat on top of the apples. Spoon a little of the oil/butter mixture over the meat. Put the sauté pan in the oven and cook the pork until the internal temperature reaches 153ºF, 40 minutes or so, turning the tenderloin about halfway through cooking. Remove the meat from the oven and wrap in aluminum foil to keep warm. Place the pan over medium heat, add the brandy, and cook until reduced by half, about one minute. Then add the chicken stock and cook until it thickens slightly, forming a sauce, about 2 minutes. Slice each piece of pork in half. Spoon a little sauce on each plate and place a piece of pork on top. Add apple and onion on top and serve hot.